We had looked at all the different ways for Stephanie to get from Banavie to the Glasgow airport in time for her Tuesday morning flight. Trains, buses and automobiles were the options. We ultimately decided a car rental was the best choice, as we could control the time of departure and also do some sightseeing along the way. We walked 3 miles to the car rental location, securing the pickup for the next day, then began exploring the area. 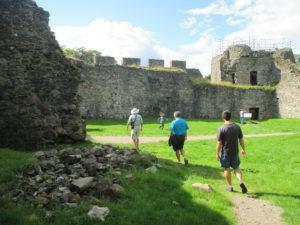 We settled on the Old Inverlochy Castle, which we’d passed on our way to the car rental, and the Ben Nevis Distillery. 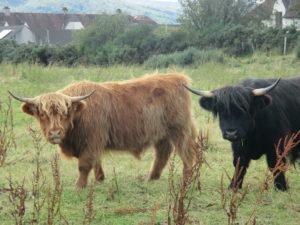 We saw these fine looking beasts several places in Scotland. 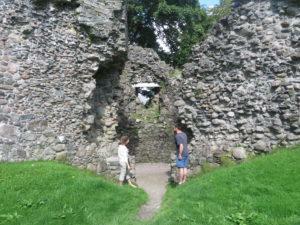 As with all the castles we saw, Old Inverlochy Castle is a ruin, but a different shape and form than the others. It was under some reconstruction and fenced off, but the fence was open and all the visitors were walking through and around, so we did too (though not up into the towers). Walking into the courtyard behind the walls gives a good sense of what it might have been like to live there. The castle is very old, from the 13th century. 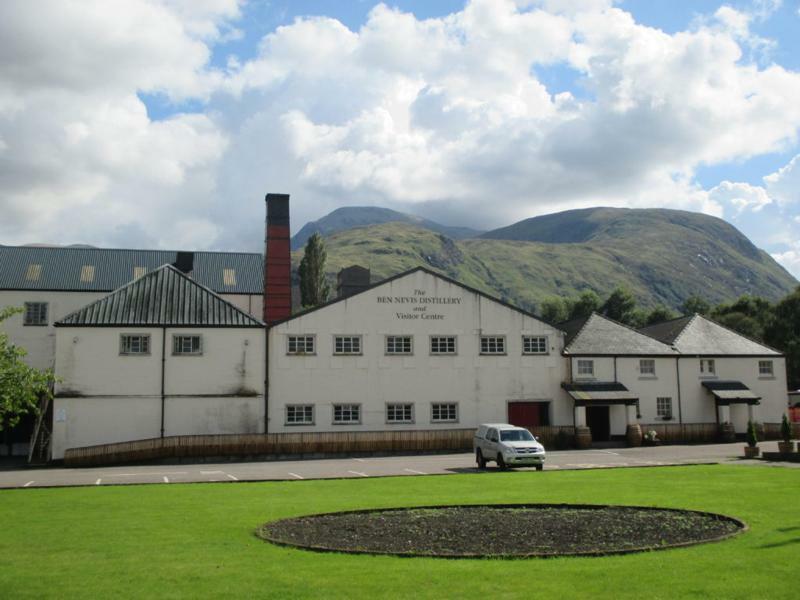 A half walk from the castle was the Ben Nevis Distillery, taking its name from the mountain peak we were planning to hike the next day. It’s nearly two hundred years old and offers a nice tour of all aspects of the facility, including a brief tasting at the end. While this was the only distillery we actually visited, we tasted several different Scotch whiskeys over the 2+ weeks and developed some preferences. We tried for an early-to-bed evening, since we knew we had a strenuous hike coming up the next morning! The distillery, with tomorrow’s destination in the background!